The Heat Team Video Premiere at the brand new D-Structure Shop in San Francisco, CA was an amazing event. 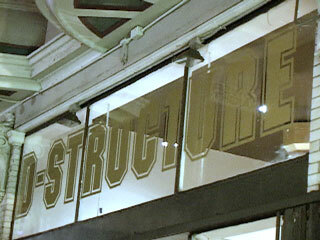 As 8pm rolled around, the D-Structure sign was still getting put up in the upper window of the store and people were all over. 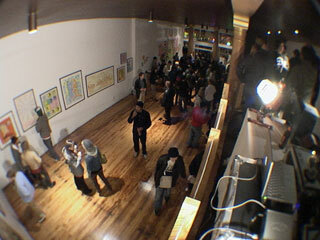 The event started off with a gallery that showed off art by The Digital Messiah, Arlo Eisenberg. A lot of people seemed to just roam in off the street that didn't know anything about rollerblading, but found the art interesting. It was a great experience to see people being exposed to rollerblading. Once the crowd was packed in like sardines, the Heat Team Video got underway. Azikiwee announced that video would begin, thanked everyone for coming and hit a switch. A huge projector screen seemed to magically decend from the ceiling. The crowd roared as the Sanyo projector switched on to reveal the Heat Team Video DVD menu. I'll start by saying that this video is as much of an artistic piece as Arlo's work that surrounded it on the walls last night. It's a non-stop collage of skating, silliness and was filmed with amazing consistency in the style and camera work. Every shot and detail seemed well planned out and far less of the guerrilla shooting style that's represented in most skate videos. It's amazing how far things have come and I was blown away by the production quality of the video. Carl Sturgess and Sayer Danforth have produced an excellent rollerblading video. The video stars Eric Bailey, Tory Treseder, Oli Short, Micah Yeager, Sayer Danforth, James St. Ours and Jeff Stockwell. Several guests are also featured in the video. The friends section contains footage of Robert Guerrero, Chris Haffey, Brian Shima, the legendary Arlo and many others. The video opens with the trick that led to the disturbing footage of Tory breaking his hand that was featured in the trailer. You should note, that you should not base your purchase of the video on what you've seen in the trailer. The trailer really does not do this video justice. The editing, composition of shots and consistent style of the video make it extremely worthwhile to watch. The Heat Team Video was packed full of tricks from beginning to end, but regardless of this they managed to get footage of extremely good stunts. Watching this, you'll recognize that the team did everything short of killing themselves for the video. The video does have it's share of standard fare content as well, but overall the Heat Team Video is something that is well worth the price of admission. The sound track of the video is full of great rock tunes and flows together between sections with a really cool rewind style effect that keeps the action going. The whole video feels unique and shows off the amazing talent of the Heat Team.